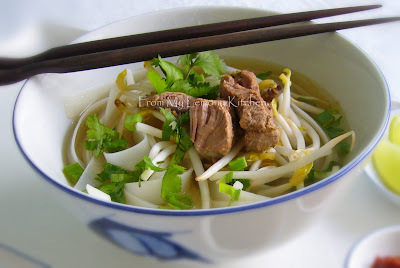 Malaysia has 'Beehoon Soup' ~ vermicelli serve with beef broth, while the Vietnamese has Beef Pho, rice sticks (kway tiow) serve with beef broth as well. The difference would be in the spices used for the broth. Vietnamese Beef Pho has the tinge of sweet spices in clear broth, tender chunky beef, the tangy lime juice and crunchy fresh beansprout... and not to mention the chilli paste..and the hoisin sauce. Place the beef, chuck bones, fish sauce and ginger in a large stockpot with 2.5 liter of water. Bring to boil then simmer for 2 hours. Dish out the 'not nice looking bits that floats up'. Add the spices and keep on simmering for another 1 hour. Strain the soup. Set aside beef chunks for garnishing. Discard the spices. Prepare the rice sticks ~ Bring water to boil in a pot... turn off the heat... place the rick sticks in and and leave in the pot for approximately 5 minutes or until the rice sticks is tender. Divide the rice sticks among bowls... top with beansprout, fresh chopped herbs and beef, ladle the hot beef soup into each bowls... 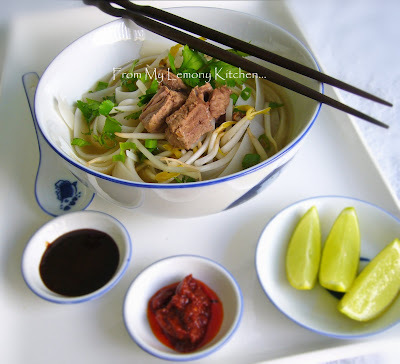 Serve with hoisin sauce and chilli and lime..
yumm..your bowl of pho looks great! Love pho! Never had a chance to make one myself yet! !